Heat the oil and butter together in a large, deep frying pan. Add onions and cook for 5 minutes, then add mushrooms and cook over a medium high heat for another 5 minutes, stirring occasionally. Add Marsala, season with salt and pepper and cook another 5 minutes or until the mushrooms are cooked through and most of the liquid as disappeared. Chill the filling for at least an hour. Lay out the pastry, cutting into two sheets – one 32cm x 26cm and the other 34cm x 28cm. Place the grated cheese in the centre of the smaller sheet of pastry, leaving a 2cm edge around the outside. Brush the exposed border with whisked egg. 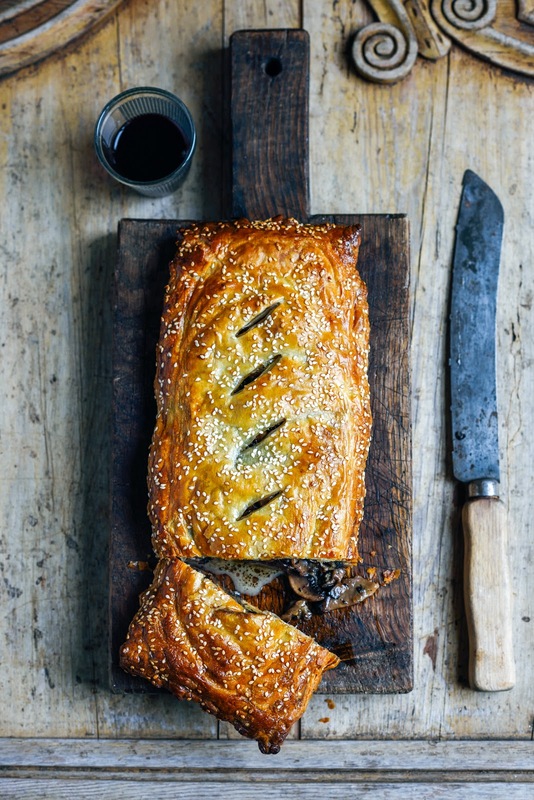 Top the cheese with chilled mushrooms, then place the bigger sheet of pastry on top and use your hands to press the pastry around them. Trim the edges and use your fingers or the tines of a fork to firmly press the seal together, then trim a little again. Brush the pastry with egg and cut five small slashes in the top to allow steam to escape. Sprinkle with sesame seeds and chill on baking paper for 30 minutes while the oven heats to 190˚C. Put an oven tray in the oven to heat up for five minutes then slide pie in, on the baking paper. Cook for 25-30 minutes until golden and irresistible. Serves 4 with mash and beans or a simple rocket salad and tomato chutney or dijon mustard on the side. Another scrumptious winter recipe Sarah ? I might have to email it to hubby to cook for me as he is about to start all the household chores for next month as I recover from surgery. Have a fabulous time in Melbourne with your boys ? ?